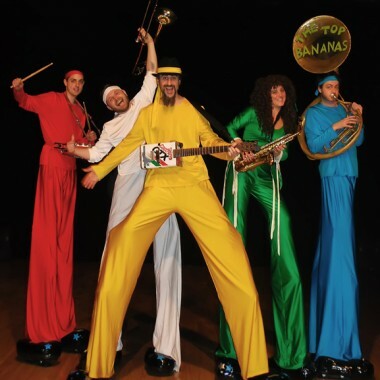 The Top Bananas, a fun stiltwalking band playing jazz, funk, disco and ska classics in a variety of costumes, are ideal for parties, festivals and family fun days. 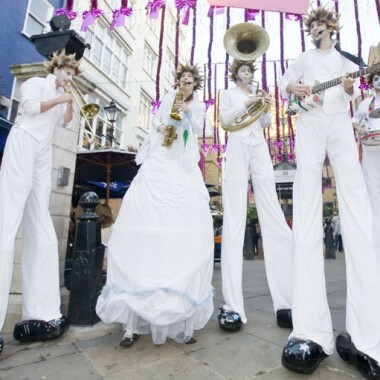 A group of stiltwalking musicians who have brought their experience of performing in other companies (Rumpel Stilt’s Kin, Neighbourhood Watch, Poles Apart, Stomp!) 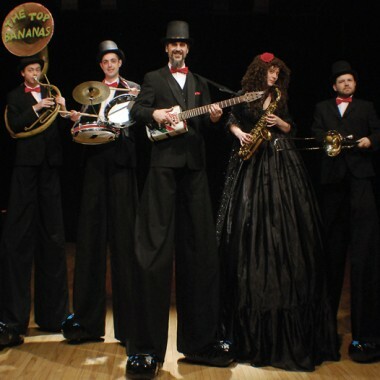 to their own stiltwalking band. 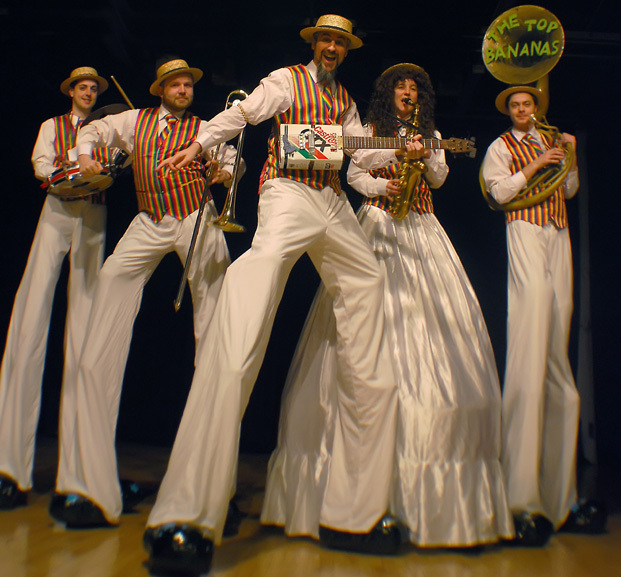 The Top Bananas play music on stilts and are based in Brighton. 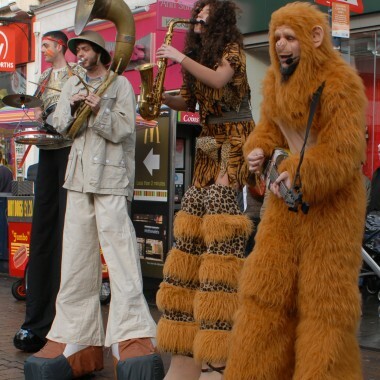 Their Jungle-themed band on stilts features a leaping monkey on bouncy stilts who plays an oil-can guitar, harmony vocals, horns, bass instrument and percussion. The band is all about fun and plays a selection of Jazz, Funk, Disco and Ska classics. Besides the Jungle Band there are also Enchanted Forest, Colourful Characters, Jack Frosts, Santa, Mrs Christmas and the Elves, Western, Sporty, 70’s Disco, Hippy/Flowerchildren, Floppy Toppers and of course Black Tie versions available. Bespoke themes and costumes possible with enough notice! “They are absolutely brilliant and I recommend them highly! We held a multicultural celebration in Hove Town Hall with over 3 and a half thousand people visiting throughout the day. Our performers were a very diverse group from many cultural backgrounds and there were children and families taking part too. The Mayor opened the event and it was also attended by Councillors and MPs. We were somewhat constricted by budget and so I asked Jim to play as part of a duo (I believe they are usually a five piece). They were exceptionally professional, performed three half hour slots and stayed all day to do this. They performed in the foyer and later when we had a mix up of times up on the main stage they went upstairs and did an impromptu set up there too. They were a real hit and very easy going on what was a hectic day.